On the eve of the fifth anniversary of the mass shooting at an elementary school in Newtown, Conn., Sandy Hook Promise — an organization founded by parents of the victims of the 2012 massacre — has released another powerful public service advertisement aimed at preventing future school shootings. The video, entitled “Tomorrow’s News,” imagines a local news report that predicts the next day’s school massacre. The spot then runs through the interviews with the familiar cast of school shooting witnesses: parents, teachers, students and first responders. “When the shooting starts happening tomorrow I’ll probably just think it’s firecrackers or a car backfiring or something,” a parent says. “Tomorrow I’ll probably point out that something seemed off with him since the beginning of the school year,” a teacher says on the faux news report. A police officer then reveals another warning sign that will go unreported. “Someone is expected to tell us after the shooting that the shooter has been posting on social media about doing this for works,” the officer says. “So how will you explain the shooting to your daughter?” the reporter asks a witness holding her young child at the end of the 90-second spot. The new ad comes a year after the release of Sandy Hook Promise’s chilling PSA, “Evan,” that shows how those affected by school shootings can miss the warning signs — even when they’re right in front of their eyes. Both ads were produced by New York-based advertising firm BBDO. 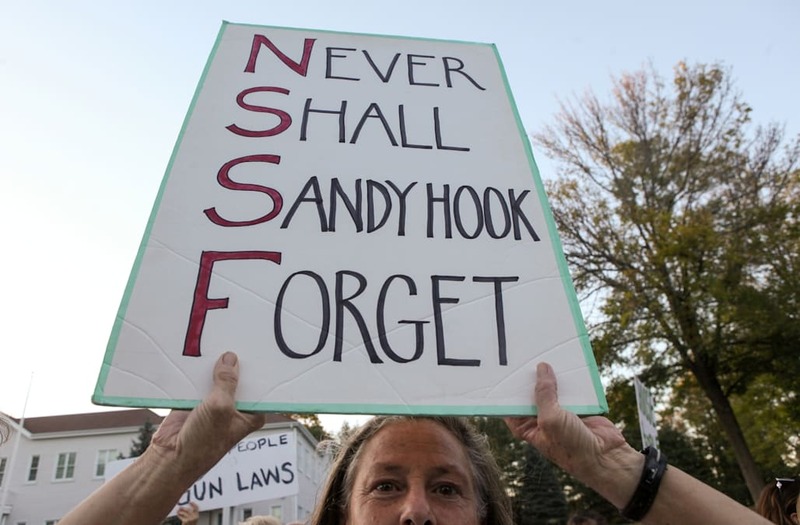 “We’re very much focused on what we can do to present these tragedies moving forward rather than always looking backwards and talking about what happened,” Sandy Hook Promise co-founder Nicole Hockley, whose son, Dylan, was killed in the Dec. 14, 2012, massacre, told Yahoo News. “The new PSA is a continuation of our message and our mission — that we’re all able to stop a shooting from happening tomorrow by being able to take action today, and part of that taking action is knowing to recognize these signs of someone who’s at risk and then intervening, getting them the help they need. In addition to “Tomorrow’s News,” Sandy Hook Promise is also releasing a new Sheryl Crow song — “The Dreaming Kind” — that was written specifically for the five-year anniversary of the shootings in Newtown. All proceeds from the sale of the single will benefit the organization.